What Is The Best Hemp Cream for Dry Skin? What is the best Hemp Cream for dry skin? This question comes up for anyone researching hemp skin care and hemp creams to treat their dry skin. Hemp creams are getting increasingly popular in the treatment of skin conditions like psoriasis and eczema. Hemp cream works great for dry skin because of it can work to moisturize and nourish skin tissue. A hemp cream can work immediately to not only soothe pain and discomfort but also to improve the overall appearance of the skin. To treat the dry cracked skin on the hands, feet, elbows, knees and other areas of the body that tend to dry out and get damaged, a hemp cream can work wonders. When you wash your hands too often, you can dry out the skin, which is why a hemp cream can be so important to so many people looking to protect and restore their skin’s appearance. Using a hemp cream can not only moisturize the hands but it can also help keep hands’ pain-free. With Diamond Hemp creams there are a variety of concentrations and scents that make keeping your body moisturized easy and enjoyable. The skin on your palms, knees, elbows, and bottoms of the feet are thicker than other skin on your body. These areas are prone to dry out quickly and become damaged more often. The main cause of damage to the skin comes from exposure to the elements, chemicals, water, dirt, and soaps, among other toxins. People who work outdoors and are constantly exposed to the elements can experience more damage to their skin than someone who mostly stays indoors. Hemp creams and hemp oil based lotions are designed to treat a variety of skin conditions and can benefit the skin by hydrating and protecting it from damage. Weather, humidity, chlorinated pools, the sun, toxins in the air and lots of other things can be responsible for people having dry skin. This kind of dry skin, the regular or normal type, can usually be treated with a simple moisturizer or avoiding the source of the dry out (like staying out of the pool for a few days). Conditions like atopic dermatitis, eczema, ichthyosis or psoriasis are more problematic and longer lasting conditions that dry the skin. Many of which can benefit from a doctors intervention to correctly identify and treat the condition. To discover if you have regular dry skin or chronic dry skin, you can ask yourself a few common questions. Is your skin still dry after heavily moisturizing? Is your dry skin red, patchy and irritated? Is the itching bothering you at night and preventing sleep? Do you have open sores on your skin from scratching? If you answered yes to more than one of the above questions, you should consult a dermatologist or doctor for more information and guidance on your dry skin condition. Lack of moisture in the skin can lead to the loss of skin elasticity. Early signs of skin dehydration include chapped lips that crack easily. It is also important to be aware of things outside your biology that may be influencing your skin’s appearance. This includes soaps, shampoos and detergents that you use in your house. Detergents and other products can have detrimental effects on the skin. Designed to be used on the most exposed areas of your body, hand creams tend to be a bit stronger and less gentle than hemp face creams, hemp baby creams or even hemp body creams or body butter. Although this is most often the case with hemp creams, when using Diamond Hemp Aloha Cream on your hands, you can also use it on your body as it is also gentle and nonabrasive. Hands are among the first place people begin to see their skin dry out and notice the signs of aging. The skin on the hands are more exposed to the elements and get used more than other parts of the body. They tend to get cut up and bruised more too since most people use their hands much more than say their elbows or knees. Also, people tend to wash their hands more than they wash the rest of their bodies. Excessive washing can dry out the skin on the hands leading to the dry and damaged skin. Designed for the softest skin type in the world, that of babies, hemp baby creams provide the utmost of gentle nourishing care. A great way to gently moisturize and nourish the skin anywhere on your body, hemp baby creams like Diamond Baby Hemp Cream can work to restore moisture and benefit skin appearance with the most gentle baby touch possible. Hemp Body butter most often contains the benefits of cocoa butter, shea butter, and hemp oil in one body softening cream. A hemp body cream tends to be thicker than lotions and provides effective moisturizing that can rejuvenate dry skin, help to heal problem patches like on elbows and knees, and can help restore skin health. Made to address dark patches and circles, tone the skin and rejuvenate appearance, hemp face creams are becoming more popular in beauty by the day. Areas of skin on the face and around the eyes require the most gentle but powerful hemp creams. Diamond CBD leads the way in this category with the Diamond Hemp Antioxidant Facial Serum. This incredibly advanced beauty formula works to gently hydrate and nourish the skin to give it a youthful glow. Outside the category of hemp body Creams are hemp body scrubs, which are more abrasive and less gentle on the skin. Many hemp scrubs often contain natural abrasive exfoliant elements like nut shells, sea salt or sugar. In the instance of Diamond Chocolate Hemp Body Scrub, not only does the formulation feature turbinado sugar and organic hemp seed oil, but it also provides the energizing effects of chocolate. The world continues to buzz about the powers of hemp creams, hemp lotions and hemp skin care products to make a big difference in the health of people’s skin. Hemp cream has many anecdotal reports of it helping to restore and revitalize the skin. 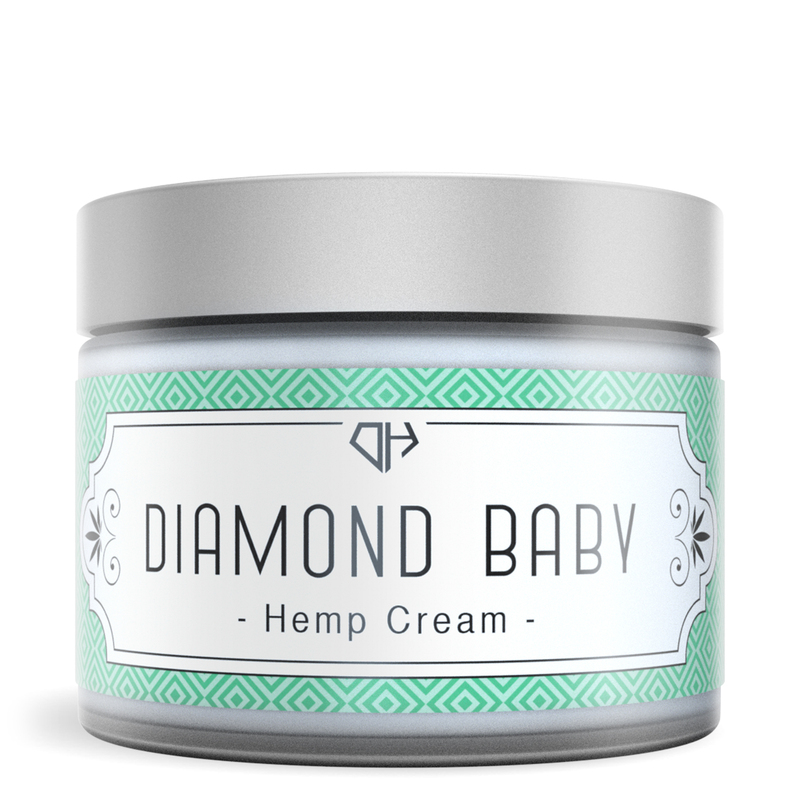 Hemp oil creams from Diamond Hemp contain nutrients that do more than just hydrate. Diamond Hemp creams are also able to protect the skin with antioxidant properties and nourish the skin with vitamins, minerals, essential oils, and amino acids. When it comes to the health of your skin, adding a hemp cream to your daily wellness program can improve your skin health and appearance. The sooner you begin using hemp creams for dry skin, the quicker you will start seeing and feeling the benefits. When choosing a hemp cream, always look for third-party quality testing on products made in the USA from organic hemp oil like those of Diamond Hemp.